Richard Hamilton responds to this interview at here. 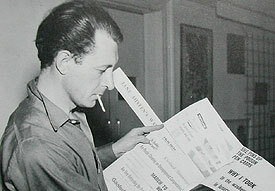 John McHale (Sr.) played a pivotal role in British Pop Art during the 1950s. He was also involved in a group show in the U.S. - "Video Art" - which included work by Andy Warhol and took place at the ICA in Pennsylvania from January 17 - February 28, 1975, before travelling to Cincinnati, Chicago and Connecticut. In an published "conversation" with McHale and Alvin Toffler in 1973 McHale noted the "shift of focus" from the "artwork to the lifestyle" of the artist, using Warhol as an example. Two of the many popular "ikons" he identified were Marilyn Monroe ("doubly interesting') and Elvis Presley ("E.P. Inc."). McHale kept a large collection of popular media from the U.S.A., U.K. and other European countries in his private studio, along with his black metal trunk from Yale that was full of "found" imagery culled from American sources. His private studio was located in a larger complex of music, photo and painting studios shared with his artist/friend Magda Cordell and her musician/composer husband, Frank Cordell, at 52 Cleveland Square in London. Many of the images from McHale's black metal trunk wound up as elements in McHale's early Pop collages. British Pop was closely associated with the ICA (Institute of Contemporary Arts) in London. The ICA was originally intended to be a U.K. version of New York's Museum of Modern Art, with an emphasis on Surrealism. Prior to World War II, the ICA's founding members - E.L.T. Mesens, Herbert Read and Roland Penrose - met with Peggy Guggenheim about establishing a centre for modern art in London. Peggy Guggenheim had opened her Guggenheim Jeune gallery in London in January 1938 but as Hitler progressed through Europe toward England she moved to the U.S., establishing her Art of the Century gallery in New York in 1942. The first meeting of the ICA's organizing committee - then known as the Museum of Modern Art Organizing Committee - took place on January 30, 1946. Although the previous discussions with Guggenheim were noted at the meeting, she was no longer actively involved with the committee when they actually established the ICA. In December 1950 the ICA acquired their first exhibition premises when they rented the upper floor of a building at 17-18 Dover Street where they remained until moving to their current location on The Mall in 1968. There were three key events in the history of British Pop: Eduardo Paolozzi's "Bunk" presentation at the ICA in 1952, the formation and activities of the Independent Group at the ICA from approximately 1952 to 1956 and the "This is Tomorrow" exhibition at the Whitechapel Gallery in 1956. Although the work has been attributed to Richard Hamilton, John McHale's son discloses in the following interview that his father told him that the collage was actually designed by himself (McHale Sr.) who also provided the "found" imagery used in the work. 1. Both your father, John McHale, and Andy Warhol were commercial as well as "fine" artists. At what point did McHale decide to concentrate on "fine" art? The difference between McHale and Warhol in terms of career paths and operating styles is the fact that McHale came out of teaching and so-called "fine" art before going into commercial design and graphics, whereas Warhol worked his way up in the commercial realm first before becoming a Pop artist. Warhol also ran his "factory"of associates like a coordinated marketing team whereas McHale was more reserved and maintained most of his marketing effort for his commercial London clients like British Petroleum, J. Walter Thompson, Air France and Revlon. The other difference was that McHale started Pop Art with a conscious sociopolitical left wing agenda to extend the boundaries of art to mass appeal and access whereas Warhol was almost totally apolitical because he favoured mixing with rich clients, jet setting, and being a celebrity artist. McHale did not denigrate Warhol for this, but he recognized it was a difference in motivation, aspiration and artistic style. Two pages from John McHale's two-part 1959 article The Expendable Ikon featuring Elvis Presley and Marilyn Monroe as examples of modern "ikons"
2. Can you give me an idea of your father's artistic background? How did he arrive at his artistic theories? From what I gather from the sporadic conversations we had on the topic during his lifetime, my father was working on his theories of art ever since his time in military wartime service in the mid 1940's, and he kept refining and defining his artistic approach over the years right up to 1954 when he coined the term Pop Art. During the war he was in Special Forces, he trained also as a Medic, and worked in Admiralty Intelligence cross-correlating masses of technical data and analysing code decrypts. He started out his aesthetic investigation with a broad based study of literature and art theory, including the classics, James Joyce, the Symbolists and Imagist Poets - and then during his studies at Teachers' College he started working directly on clay forms, symbolism motifs, and pottery. Furthering his investigations in art and literature and pottery, he made several trips to Paris where he met Tzara and Leger and others. After his sojourn in Paris where he was exposed to Dada, Cubism, and Futurism, he returned to London and set up a studio at my great grandfather's #8 Randolph Mews in Maida Vale, and started to frequent Hampstead where he became interested in the British Vortists, followed by abstract art and Russian Constructivism, and Mondrian. This was the period in which he pursued a deep study of optical perception and colour theory, which tended to be less concerned with subject and concrete content and more about the distillation of art into abstract form. While working on his Constructivist sculptures and attending discussions and exhibiting at the ICA, he was also working in parallel on other aspects of his artistic theories that were more to do with the investigation of symbolic content and subject, signs, language and meaning, and the role of the media. In coining the term Pop Art most of the concepts were first articulated by McHale, followed by his Pop artworks, such as his collage, Why I took to the washers in luxury flats. The reason that my father took to luxury flats is because he had moved from the Randolph Mews stables and was by then sharing the artistic atelier with the Cordells  and living in the lap of Regency luxury of 52 Cleveland Square, which he also depicted in the design layout of his Pop Art poster collage design for the "This is Tomorrow" exhibition. When one views my father's contribution to "This is Tomorrow" it is evident that he was working in at least two parallel modes that were mutually reinforcing in terms of theory and works of art. He extended his Constructivist investigations and optical colour theory work that was supplemented by his recent study with Albers at Yale, and exhibited his Vortist inspired Op Art dazzle camouflage disorientation panels at the portals to "This is Tomorrow". At the same time he designed the Pop Art poster and exhibited his integrated Pop Art installations. Some of this work he applied to his thriving commercial art and design business. The Op Art work was later used in his commercial work for Revlon. His formative Pop Art collage work was used in his commercial design work for Talkie Strips and other multinational clients. Later, starting in 1962, McHale went on to teach at university in the USA, where he continued to use the theme of the sitting/living room layout in his teaching design courses at Southern Illinois University (SIU). While at the Center For Integrative Studies, John McHale conceived his innovative ideas on Futurism, the information society, and on the Ecological Context. He wrote the Future of the Future, and was in direct contact with most of the leading think tanks of the era which he documented with Magda Cordell in the Futures Directory (pub. Westview Press), including: RAND, The Hudson Institute, SRI, M.I.T., and Betrand de Jouvenal in Paris. He was a Member of the Royal Academy of Arts and Sciences, a founding Member of the Club of Rome, and a latter day Knight of Malta. 3. You say that your father coined the term Pop Art. Some art historians credit Lawrence Alloway with this, often citing his 1958 article, "The Arts and the Mass Media." However, Alloway never actually used the term in the article. He acknowledged this in his 1966 essay, "The Development of British Pop," which forms chapter one of Lucy Lippard's book, Pop Art. In the essay, he wrote, "The term 'Pop Art' is credited to me, but I don't know precisely when it was first used..." He further noted that "sometime between the winter of 1954-55 and 1957 the phrase acquired currency in conversation, in connection with the shared work and discussion among members of the Independent Group." Did your father discuss with you the origination of the term "Pop Art?" My father, in the mid 1960s in Carbondale, Illinois, distinctly told me that he (John McHale) coined the term "Pop Art" in an ongoing conversation with Lawrence Alloway circa 1954. What my father neglected to mention, and what I surmised, was that my father was also assisted in developing his Pop Art theory with the crucial insights of his friend and colleague Frank Cordell who McHale shared an atelier with at 52 Cleveland Square. Alloway and my father had been having an ongoing conversation about aesthetics since the late 1940s and had not made the significant distinctions and some of the conceptual breakthroughs about the popular media until in 1952 my father started meeting and conversing with Frank Cordell who professionally knew the commercial popular media and the advertising industry inside out. I suggest that Alloway is being rather disingenuous and ambiguous in his statement. He is neither denying nor confirming his claim to the term "Pop Art." He certainly must have been fully aware of his ongoing conversations with McHale and about McHale coining the term. Alloway also knew about the strong artistic association between McHale and Frank Cordell. As you note, Alloway does not seem to be able to remember when he personally used the term Pop Art, but that it was used "sometime between the winter of 1954-55 and 1957." So Alloway confirms that "Pop Art" was being used in Independent Group conversations circa 1954. This corroborates my father's claim regarding the term being used circa 1954. We know from the record that McHale also produced two Pop Art collages in and around the same 1954 period that are full of popular media content and references to his life. McHale's Transistor collage and his Why I took to the washers in luxury flats of this period can be conceptually linked in iconic content to his later Pop art poster design for the "This is Tomorrow" exhibition. McHale's Transistor collage was full of Pop media clippings, including a fragment of a comic book and dialogue balloon. Furthermore, we know from the record and from Hamilton's own account in the Tate magazine  that McHale was discussing Pop Art with Hamilton at the inception of the Team Two preparations for the "This is Tomorrow" exhibition in 1955 prior to McHale leaving for Yale. Where one has to be very careful with Alloway's remark is in the meaning relating to "shared work and discussions." After McHale coined the term in 1954, it was evidently being discussed among Independent Group members, but it should be noted that in the beginning, the members did not necessarily subscribe to Pop Art. 4. Did your father stay in touch with Alloway after Alloway moved to the states? Yes, my father corresponded with Alloway in America. He was trying to urge his old friend Alloway to put on a show in New York that would showcase British modern art and sculpture particularly as it relates to the human head and human form. McHale wanted Alloway to mount and sponsor a show in New York of works by the formative ICA artists including McHale's Pop art collages, Magda Cordell's Brutalist paintings, Paolozzi's formative collages and Brutalist sculptures, Hendersons's collage, and Turnbull's sculptural work. After spending a great deal of time and effort, Alloway reneged on his promise to McHale. Up to that point the USA had been sending over large abstract art exhibits backed by institutions and government financing and there had been no quid pro quo of British modern art featured in the USA. To make matters worse, Alloway was beginning to publish material on Pop Art that ignored the British and played up the later emerging scene in the USA without giving any credit to McHale. So a rift developed between them that gradually became irreparable. By the time when McHale later moved to the USA in 1962 and launched his Futurist ideas at SIU, and Alloway later came to lecture as a resident at SIU, the rift between them was evident and the old ICA bonds had completely cooled to a mere exchange of social niceties. This is the main reason for Alloway's deliberate attempt to expunge McHale from the artistic record. McHale did not hold the same degree of rancour toward Alloway. He recognized that Alloway was getting the Pop Art message out to the American scene. At one point, in the early 1960's, after his SIU associate Bucky Fuller had been featured on the cover of Time magazine, McHale was also asked to explain his Pop Art and Futurist ideas in Time and be featured on the cover of Time, but he regrettably refused for personal family reasons. 5. In January 1957 Richard Hamilton wrote a letter to the architects, the Smithsons, in which he noted the attributes of Pop Art. In his book Collected Words, he noted that "At the time the letter was written there was no such thing as 'Pop Art' as we now know it. The use of the term here [in the Smithson's letter] refers solely to art manufactured for a mass audience. 'Pop' is popular art in the sense of being widely accepted..."  In other words it was more of an abbreviation for popular art than a recognized art term at the time. Wasn't the "This is Tomorrow" exhibition a reflection of the Pop Art attributes that he listed in the letter? As the letter was dated some four or five months after the close of "This is Tomorrow" in August of 1956 and almost half a year after the production of Just what is it that makes today's homes so different, so appealing? it most likely had no bearing on the actual production of the collage and only served as some form of post-hoc record of Pop Art attributes. Hamilton says "at the time of the letter there was no such thing as Pop Art as we know it." First it is unclear who he is implying by "we." The Royal "we? The crowds of Londoners who flocked to the opening of "This is Tomorrow" in August 1956 to witness the Pop Art readymades, including Robby the Robot, that McHale had requested Frank Cordell to access and that were prominently positioned at the portals to "This is Tomorrow", available for everyone to see? Perhaps Hamilton was unaware that McHale had coined the term Pop Art circa 1954 and that both ICA and Independent Group members were using the term Pop Art in conversation at the ICA two years prior to Hamilton's letter to the Smithsons? By his own admission Hamilton clearly states that prior to going to Yale, McHale was discussing Pop Art with him in the Team Two preparations for "This is Tomorrow" as early as mid 1955. We also know from both the ICA record and the MIT document  that McHale had assembled the Pop Art designs for "This is Tomorrow", and a few months after McHale mounted another exhibit at the ICA of his numerous other Pop Art collages. So what does Hamilton mean precisely by "there was no Pop Art as we know it?" Does Hamilton mean that before McHale coined the term Pop Art that there was no Pop Art as we know it? 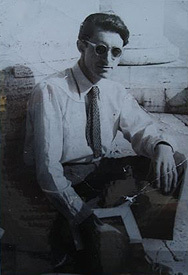 McHale had already produced his Transistor collage in 1954 which was full of Pop media clippings and abstract references that link to his life and the scientific invention of the transistor, which he later conceptually linked to his Pop Art poster design for "This is Tomorrow". Similarly, McHale produced his Why I took to the washers in luxury flats collage which is a multi-logic state decision tree gaming collage crammed full of Pop Art media material in 1954. Hamilton had also helped to cut out and paste down McHale's Pop Art poster design almost half a year before his letter and pronouncements to the Smithsons. Perhaps, according to his note, Hamilton means that the list of Pop Art attributes included in his letter to the Smithsons was intended by him to have a very restrictive meaning and interpretation in which "the use of the term refers solely to art manufactured for a mass audience," thus ruling out McHale's Pop Art design and other artistic productions because it was made by an artist and not manufactured. Or maybe Hamilton's account is somewhat manufactured, since we are left unsure whether his alleged letter was ever sent to the Smithsons who are on record as being rather anti-Pop Art. 6. Earlier you referred to your father's Pop Art "theory." Do you mean his use of "found" imagery or had he actually developed an aesthetic philosophy of Pop? Or was his idea of Pop similar to Hamilton's list of Pop attributes in his letter to the Smithsons? It was definitely more than just an inchoate series of ideas or a rudimentary list of disparate items. It was a coherent integrated and logically consistent set of concepts articulated within a well defined aesthetic framework and approach. From my discussions with my father it was apparent that he originally conceived of Pop Art as being more than just some glib advertising and reflection of popular culture. What he was seeking was a total reexamination of the prevailing artistic views, assumptions and conventions of the time. It started with a conceptual confrontation about the prevailing notions and conventions about High Art versus Low Art, particularly as held by the Art Establishment and the academic community. My father came from a strong Scots trade union Socialist no-nonsense working class background where the rights of the common man were paramount. It was about the Vox Pop confronting the power elite. After McHale examined and demolished the logical inconsistencies in the conventional notion of high/low and fine/folk art dichotomy that he saw were based on social convention and power relations, he then went on to viewing art as a continuum.There was no real logical reason for the artificial dichotomy between so called high and low art promulgated for centuries - more for social status and power relations than for honest artistic principles. He believed there was "no preferred source" of art, or preferred class of individuals when it came to producing art. A collage could draw from any source or include two and three dimensional forms, be produced by an individual or a group and be produced on paper, film or electronic media, depending on the artist's choice and design. Most of so-called fine art was rife with learnt conventions that had accreted over time. As an artist one could learn these conventions if one chose and use them in one's work, or one could exercise Existential choice, and choose to dispense with them and create new conventions and modalities that were equally acceptable as art. For example, the use of "gesture" or "gestural" art, dance, burlesque, film acting, installation art, or even some forms of bodybuilding were just as acceptable an art form as any conventional so called high art oil painting. Art could legitimately draw on "pulled" or manipulated as found images and sources from media and the commercial realm and still be considered art. Images could be fixed, permanent, ephemeral, or they could be "expendable ikons" depending on one's choice, source or channel of information. McHale, like Innes and McLuhan, believed that the "medium is the message" dispensed over space and time. This may not seem radical in the present century, but half a century ago these were fighting words and cutting edge concepts. Pop Art was about opening up aesthetic possibilities and making art freely available to all. These views show up in McHale's Pop art work. For example, while he was at Nelson Teachers' College in England in the 1940's and later at Yale University in 1955-56 there was a raging public debate about the moral turpitude of comic books and how they were deemed to be corrupting young minds and leading to illiteracy. There was a U.S. Senate investigation underway on Juvenile Delinquency in which comic books were singled out as morally corrupting influence on young minds. McHale reasoned differently and he took a counter view based on his London teaching experience about early language acquisition and reading skills and from his familiarity with Baudelaire's prescient views about cartoons as acceptable art forms. In artistically referencing these views, McHale included the depiction of a comic book cover affixed to the wall of his Pop Art collage poster design for "This is Tomorrow". The particular comic book he chose is emblematic of his life at 52 Cleveland Square, and links to Yale, and also reflects the prevailing "comic book wars" that were erupting while McHale was studying in the USA. This comic book theme, relating supposedly to juvenile delinquency, is also linked by McHale to his readymade at "This is Tomorrow" of Marlon Brando and The Wild Ones. 7. You've referred several times to your father's pop art collage. Are you saying that the collage Just what is it that makes today's homes so different, so appealing? should be attributed to your father rather than to Hamilton? I am definitely stating that, according to what my father recounted to me in the mid-1960s in Carbondale, Illinois, that he, John McHale, while studying at Yale, provided the original measured design specifying the exact positioning of all the visual material and structure of the Just what is it that makes today's homes so different, so appealing? Pop Art collage to Richard Hamilton in London. He also provided all the visual material for the collage which was in McHale's London studio and which Magda Cordell provided the Hamiltons access to for the mechanical cut out and paste-up of the collage. McHale at Yale was sending over design ideas that Hamilton was rejecting. Time was running out and Hamilton had no Team Two poster to print and distribute prior to the opening of "This is Tomorrow". McHale either sent over the design of the Pop Art poster separately or it was in McHale's black trunk in his studio at 52 Cleveland Square. The collage was pasted up in the living room of 52 Cleveland Square and, according to my father, actually depicts the layout of the living room. Hamilton may or may not have used a list to supplement his paste-up production but he was relying on McHale's original design for the precise placement, dimensioning and structure of the collage. McHale returned to London and assembled his Pop Art readymades for "This is Tomorrow" with the cooperative assistance of his artistic colleague Frank Cordell - who accessed them from his extensive contacts in the film and media business in London at the time. Before the war Cordell was a professional jazz musician and worked for major film studios in London. He was in Bomber Command during the war, and the British Information and Intelligence services. After the war he composed and conducted music and worked for the BBC, HMV and most of the major film and music corporations and TV stations and was a top-billed London artist. The spirit and intent of cooperation has been broken by Richard Hamilton publicly and erroneously implying in his Tate interview that McHale had little to do with the outcome of "This is Tomorrow", and Hamilton also erroneously asserting full credit for Just what is it that makes today's homes so different, so appealing? when he merely worked on the collage mechanicals for the poster. Also it appears that when Hamilton originally appended his signature to the sales transfer document for the work he did so without recognizing his production co-workers or giving due credit to McHale for the master design of the collage. It seems Hamilton has built part of his artistic reputation on appropriating other artists works. In his BBC interview  it is rightly recognized that Picasso appropriated others' work, and he seems to use this to justify taking license with fellow artists. For example, it is recognized that Hamilton cloned Marcel Duchamp's work, Large Glass - also for his Interior collage study he modified a depiction of Velasquez' Las Meninas . He used the My Marilyn gimmick title that alludes to Warhol's and McHale's previous Pop Art works. He also produced a later collage clone of McHale's Pop Art poster design and a painting using abstracted elements of McHale's Dazzle panel and readymade Duchampian rotorelief from "This is Tomorrow". There seems to be a pattern to Hamilton's "appropriations." However, it is one thing to incorporate and modify the context of a work and a completely different order of magnitude when an artist does not acknowledge another artist's work as he has done with McHale's original design and selection of iconic images for the collage Just what is it that makes today's homes so different, so appealing?